The site of Dimini in Thessaly, Magnesia (central Greece) is known for both its Neolithic and Bronze Age Mycenaean settlements, with the latter also showcasing its own trademark megaron (palace) that could have been a part of the Iolkos – the legendary place mentioned in the mythical narrative of Jason’s quest for the Golden Fleece. Well, this time around, archaeologists from the Ephorate of Antiquities of Magnesia came across a unique Mycenaean tomb within the perimeters of the site. Touted as the earliest known example of the built-chamber type of tomb found in the region of Thessaly, the large enclosed space held the remains of at least 20 people, including three children. In the framework of the NSRF Project for the protection and promotion of Megara A and B of the Mycenaean settlement with the installation of metal shelters, it was necessary to construct a rainwater catchment tank. 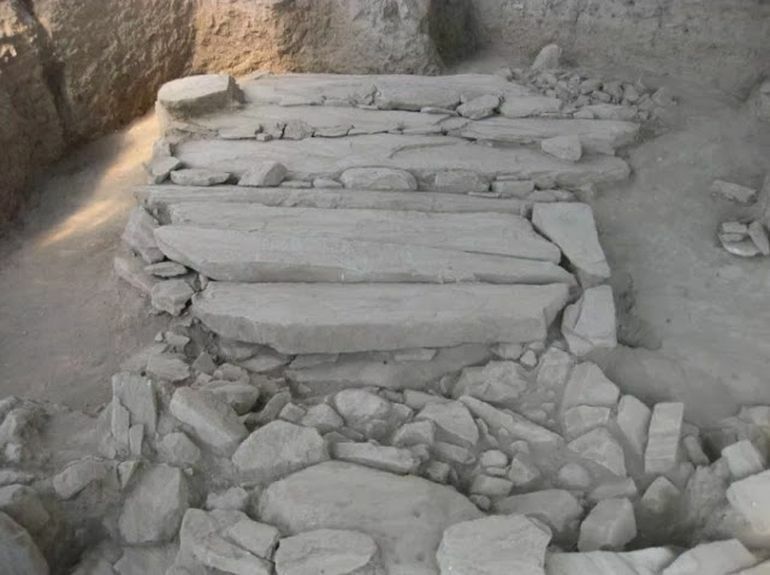 During the excavation, a section of a stone enclosure was uncovered and which was found to be part of a large tomb. The enclosure, of which only a small part has been investigated, is ellipsoidal in shape and has a diameter of about 7m. It consists of a stone circle, 0,50m wide and 1,70m tall, and on its outer face are mounted monolithic vertical slabs 1.30m in height. 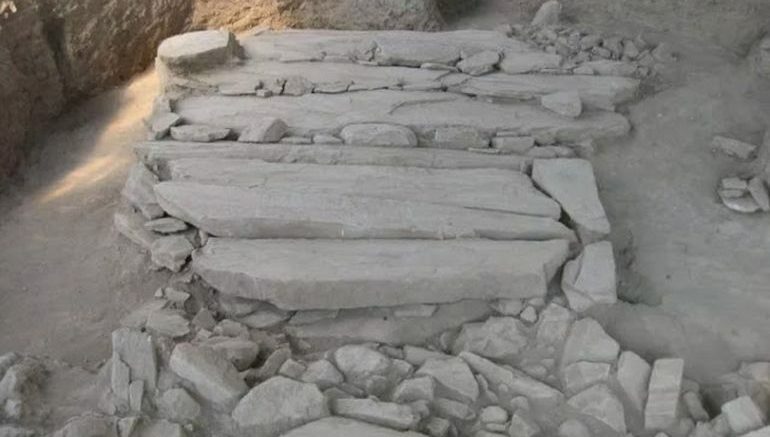 The investigation of the enclosure is continuing and archaeologists expect to find new elements which will help complete the picture of this impressive and unique structure. A large L-type chamber tomb was found in the center of the enclosure. Its external dimensions were 3.80m x 3.30m (max) -2.70m (min). Inside, the long sides are lined with vertically elongated slabs, similar to those of the enclosure, with a height of 1,00m to 1,10m, width 0,40m to 0,64m and a thickness of 0.008m. The narrow sides are covered with monolithic slabs at the bottom, while on top there are worked stones placed horizontally. At the end of the NE side is a narrow opening, sealed with a vertical slab, and a stone threshold broken into two sections. On the NW side, there are remains of older burials, heaped in a pile on one side without special attention, and on the NE side, an adult skeleton was found in a contracted position with the skull resting on a tall stone. A preliminary examination of the osteological material revealed that a total of 17 adults and 3-4 children were buried in the tomb. 16 vessels, including drinking cups, storage vases, and cooking pots, were collected from among the remains. Other finds include 5 clay spindle whorls, one bronze needle and 3 bronze pins (two with rock crystal heads), gold and silver clasps, bronze rings, as well as beads made from amethyst and sardonyx. The tomb was constructed between 1750/1720 and 1680 BC and was used from 1700/1665 to 1635/1600 BC making it the earliest example of a built chamber tomb in Thessaly. It therefore forms a connecting link between the earlier burial mounds and the later vaulted or beehive tombs, and belongs to a pre-Mycenaean cultural tradition that appeared in areas close to the eastern and southern shores which had contacts with the Aegean Islands via Dimini, which controlled the port of the Pagasitic Gulf and was thus a gateway to the Aegean. The architecture, the rich funeral gifts and the fact that it was used for multiple burials suggests that the tomb is not a simple burial site, but belongs to a privileged ‘elite’ class that developed through complex processes taking place from the Middle to the Late Bronze Age, particularly in the Peloponnese and Athens, but also in Thessaly, as shown by recent investigations. The evidence from the settlement in Dimini clearly shows that by the end of the Middle Bronze Age a new wealthier class had emerged from the local population who clearly wanted to differentiate their position from other social groups by adopting a more complex funerary type, while the offerings indicate some wealth and access to resources, perhaps through the development maritime trade.